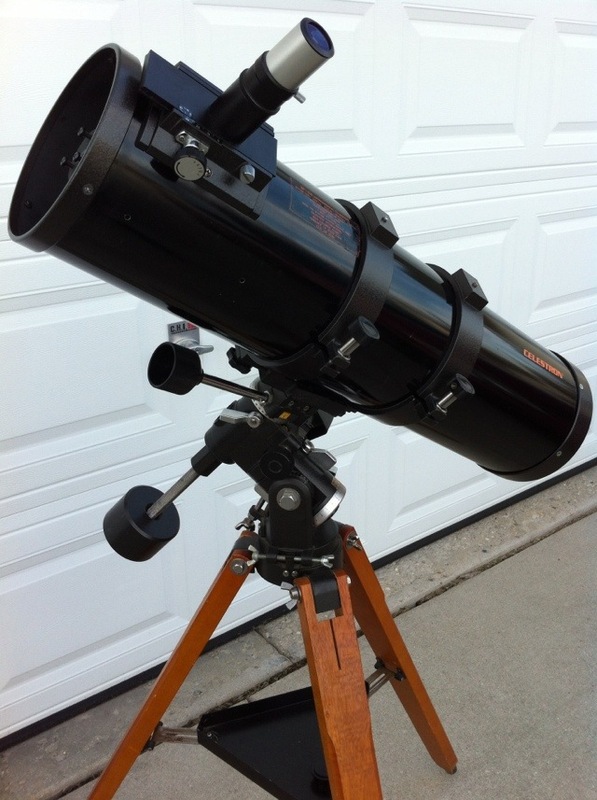 The original Celestron C6 was a Polaris-mounted 6" f/5 Newtonian. 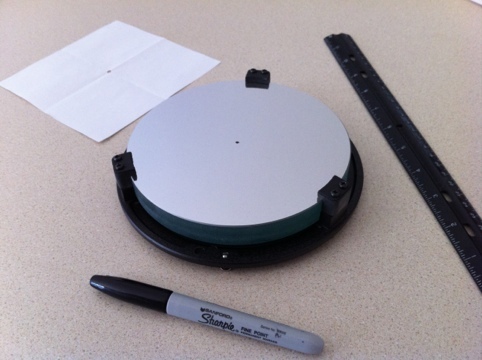 A few months ago, I wrote about the Celestron C6 Newtonian reflector that was produced by Vixen back in the 1980’s. It was the third of four “classic black Celestrons” that I remembered from when I was a kid, and unique in that it was a wide-field telescope in contrast to the Firstscope 80, C4.5 and C8. While my early attempts to acquire one were unsuccessful, a few months ago I did win an eBay auction for a C6 optical tube assembly. It arrived without a finder or a front endcap, but I’ve got a friend who may part with her original 6×30 finder from her SP-C6, and heavy-duty shower cap functions as an effective tube cover. There are a few small nicks in the paint, and two small holes where a Telrad base was mounted, but a little touch-up will fix those tiny cosmetic issues. I’ve had a lot of fun tinkering with this scope (mostly in the garage and the driveway so far), and I’ve learned a few things. The first thing I’ve learned is that the Polaris mount is more than adequate for this telescope. I really can’t think of a reason why Celestron switched this scope from the original Polaris to the much-heavier Super Polaris mount, other than increased profits in a more astrophotography-ready package. I’m thinking the astrophotography-profit angle here because there were optional dual-axis drive motors available for the Super Polaris, they could charge more for the heavier mount itself, and the 6″ f/5 OTA has a constant-distance “sled” focuser with a generously-sized secondary mirror which would appeal to shutterbugs of the day. At any rate, for visual use, the Polaris mount is simply wonderful. Even without a second counterweight and the scope being woefully out of balance, when I lock it down, it doesn’t wiggle. At all. It's easy to drop the rear cell from the C6, just like it is for the C4.5 -- once you know how. That makes it easy to center-spot the primary, which is necessary for collimation. Another thing I’ve learned is that Vixen really did a great job on their Newtonians. Just like the C4.5, the C6 primary and secondary mirrors are easy to adjust. In fact, this scope practically invites collimation! It was a simple matter to drop the back half of the cell and center-spot the scope, and once I had a proper reference, the scope was collimated in a matter of minutes. The only plastic on the scope is the single focuser knob, and the rack and pinion gears of the “sled” style focuser. I’m told that those plastic gears are the only real points of potential wear and failure on this scope; everything else in the focuser is aluminum. Oh, if they just used brass for those two little parts instead of plastic! If I ever have problems with the plastic gears in the focuser, that’s what I’ll use to replace them. I also learned why they don’t make threaded declination shafts anymore. These were super-cool-looking on the giant yellow Byers mounts that graced the 1960s and 1970s Questar-12 ads in Sky & Telescope. Perhaps in an attempt to enhance the precision feel of the original Polaris mount, the declination shaft is, in fact, a single length of 16mmx2.0 threaded rod. It does look great, and makes it easy to fine-tune the counterweight position. However, it also makes it a major pain to move the counterweight any significant distance, and taking the counterweight off the declination shaft for portability is more trouble than it’s worth. For the C4.5 OTA, there’s only one counterweight and it’s not a big deal to move the entire thing — mount and scope — around because it’s so lightweight. I’m thinking the second counterweight is going to be around 8 pounds to accommodate the larger C6 OTA, so that’s going to make the overall setup noticeably heavier. It’ll be easier to remove the entire declination shaft for transport, should it become necessary. Hi Mike! Sorry I’ve been away from the blog lately; I very much appreciate your post! I’ve recently procured a Super Polaris mount for my C6 OTA, so I’m in good shape. However, there are others I know that may be interested. Please let me know the details if you still want to sell it. The plastic focuser gear on my SP-C6 broke. Do you have any idea where I can find a replacement? Hi Sammy! Unfortunately, I don’t know of a place to find a replacement gear. Other than eBay or Astromart, you could try Vixen USA as a contact (their parent company, Vixen of Japan, made the focuser originally). Another option *might* be to have someone make you a new gear — if you have a “FabLab” near you, that would be a good place to start. Hello. I was just given one of these C6’s last week by one of my brothers. The mount broke decades ago but he kept the scope. What would you think would be a good replacement mount? Thanks. Hi Patrick. If the mount is still around, it may very well be worth fixing. But if it’s gone, the Celestron Omni CG-4 or similar other-branded mount would work fine. If you want computer control, the Celestron Advanced VX mount or similar other-branded mount would be more than enough. Thanks. Those are nice but way too much for me. The best way for me will be to build an alt-azimuth using pipe. Was out of Arizona for months. Posted my Telescope on Sierra Vista CL again. $450 with many extras. Nice scope.